Rebuilding a team is a tall task no matter what the circumstances. For professional ultimate franchises, it often seems that refurbishing is the norm over consistent team rosters and cultures. The DC Breeze faced a rebuild in 2018, not one of astronomical proportions, but one to find their new identity and voice going forward. Despite churning out their lowest win total since 2015 and not advancing to the Eastern Division Title Game for the first time in the same span, DC rallied for what looked to be a difficult year into a solid success. The DC Breeze lost 49 percent of their scoring before the 2018 season began. With five of the team’s top seven goal scorers and the top assist leader not suiting up for a single point, keeping a consistent offense on the field clearly was going to be a tall task. Early on that became evident and almost prevented the team from making the postseason for a third straight season and fourth time in five year. To many observers the Breeze had become the standard for an expanded offensive scheme, yet they had to find new role players and find a new way to win. And they did. Achieving an 8-5-1 regular season record, the Breeze did not disappoint this year. The team’s offensive efficiency dropped to 0.27, a stark contrast from 2017’s 0.38. Even with Matthew ‘Rowan’ McDonnell often pulling double duty and totaling 39 goals with 52 assists on the year, there was only so much the MVP candidate could do. A rotating door of young O-line players, with head coach Darryl Stanley searching for perfect combinations on a weekly basis, cost the Breeze in efficiency. DC was able to keep pace for one of the remaining two playoff spots behind runaway Toronto thanks to many other teams in the East Division looking to find the same formula with modified rosters. Ultimately, the team hailing from the nation’s capital was able to overtake the New York Empire 2-1 in their regular season series to gain the No. 2 seed. As it turned out, that advantage did not matter. Second year player Nate Prior showed that he is human at the handler position, at least in a monsoon, and unfortunately for the Breeze that monsoon came at one of the worst times possible. In nine regular season games the Maryland grad kept up an outstanding 98 percent passing in his O-line handler role with only eight throwaways in those games. But in the storm-soaked first round of the playoffs, he matched that full-season total in 60 minutes of action. Still he finished 436-for-452, an amazing model of efficiency. 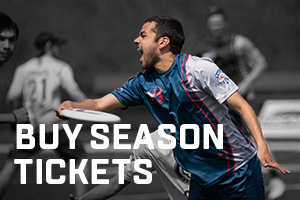 Finishing the season with a plus-81, McDonnell had the fifth-highest mark in the AUDL. It was by far the best season of his three years with the team. At 29, he set career-highs in his plus-minus, goals, assists, hockey assists, completion percentage, and Callahans. All of these accomplishments were done in only 10 regular season contests. He was the face of the franchise this year, carrying the banner and leading the charge for the Breeze in almost every way. In fact, the only legitimate black mark against McDonnell this season was his attendance record, missing four of the team’s 15 total games. Despite McDonnell missing 4 games, only one player participated in more points played: Delrico Johnson. As the stalwart of the D-line and one of the primary cutters on the O-line, Johnson played in 348 points, which equates to about 25 points per contest. He led the team in blocks (21) once again and handled the team’s pulling duties 34 percent of the time. Along with captain Brad Scott, Johnson charged a very young D-line to roughly the same mark as a year ago: a -0.36 defensive efficiency compared to -0.35. Johnson’s plus-67 was second on the team, and he also paced the team with 41 goals. Right behind the Towson graduate in scoring was Jeff Wodatch, who became the team’s all-time leading scorer with 119 goals combined in the regular season and playoffs. At 40 goals in 12 games, Wodatch once again showed why he is the most prolific scorer in Breeze history. Their superstar presence allowed two young talents to shine. Second year player Joe Richards dazzled on the D-line, while Christian Boxley provide a huge offensive spark toward the end of the season. Richards, a Mary Washington player standing at 6-foot-3, complied 16 blocks to break through in his sophomore season. Hitting double figures in goals (14) and becoming more consistent with the disc in his hand, his playing time exponentially grew. The lightning in the ‘Box’ for the Breeze, though, was the rookie Boxley. Breaking onto the scene against the Pittsburgh Thunderbirds, the 22-year-old gave us a taste of what he could accomplish. Three weeks later he had seven goals on the back-end of a double header against the Ottawa Outlaws, followed by two back-to-back six goal performances against the Philadelphia Phoenix and the Empire. Had the young cutter played for the entire season at the same pace, he would have a franchise record of 56 goals in the regular season. There is still plenty to come for the Georgetown standout, and the same can be said about this young Breeze team as a whole. Rebuilding anything is not an easy task. Some say tearing it all apart and starting from scratch is easier. There was no starting from scratch, there essentially was no rebuild – but when it was all said and done, the team was again eliminated by the Eastern Division Champion in the playoffs. Still, despite the roster overhaul and all the young players, DC was back in the postseason for the third straight year and fourth time in franchise history. Aside from the Toronto Rush, there is no team with a better pedigree in the East. It all came together when the Breeze won six of their final seven games in the regular season. Had Mother Nature been singing a different tune on that Saturday evening in late July, the Breeze may very well have prevailed as they had just one week earlier against the same Empire team, and this could be a whole different conversation. The veterans held down the fort in 2018, allowing up-and-coming stars in Washington D.C. to emerge and have a big impact. The only question, as it is every season, is will it be the same team we see take the field in 2019?